Purnea Lok Sabha Vikas Parishad (PLSVP) had organised an essay competition for school and college students of Bihar in the fond memory of former Prime Minister Late Shri Atal Bihari Vajpayee is receiving a huge response in the first year itself. Looking at the enthusiasm and positive response amongst the students of Bihar, the organisers have decided to extend the deadline of the state-wide online essay competition that kicked off on October 2, Gandhi Jayanti. The multilingual essay competition started accepting entries from 8:00 am from October 2nd, 2018 and was expected to end at midnight October 19, 2018. But the organisers have now extended it to November 14 i.e. Children's Day. "The competition has already received a huge response, we have received more than 8000 entries so far. Meanwhile, we've received requests across various quarters in Bihar that several students, who were busy with the festivities during the Navratri, couldn't participate in the competition. Hence, we have decided to extend the deadline. The entries could now be submitted until midnight of November 14, 2018, which is also celebrated as Children's Day," said former MP from Purnea Lok Sabha seat & PLSVP patron, Uday Singh. Uday Singh is the brains behind this competition which will be held annually. Rahul, a college student and a participant, while talking about the competition said, "As Navratri is celebrated with big pomp and show in Bihar we were all in the festival mood and couldn't complete our essays. He has requested our teachers to raise this issue with the organisers to extend the deadline for submission of the entries." A student from Patna, Roshan Ara, who wrote her essay in Urdu said, "This competition will help the candidates know more about the vision and philosophy of Atalji and during my research, I learnt about some untold stories of the former PM. It was under Vajpayee Government when India successfully conducted the Pokhran Test despite being under so much of international pressure." Another girl student Arti, from Begusarai, too highlighted the fact that she wanted the deadline to be extended. "Due to Navratris, I wasn't able to complete my essay because I had to help my mother with the daily chores as she was fasting all nine days. Not just me, many of my classmates too faced a similar problem. I urge the organisers to extend the deadline," said Arti, a student of Class XI. Every student of Class 10 to 12 in the state of Bihar is eligible for participation in this online competition. 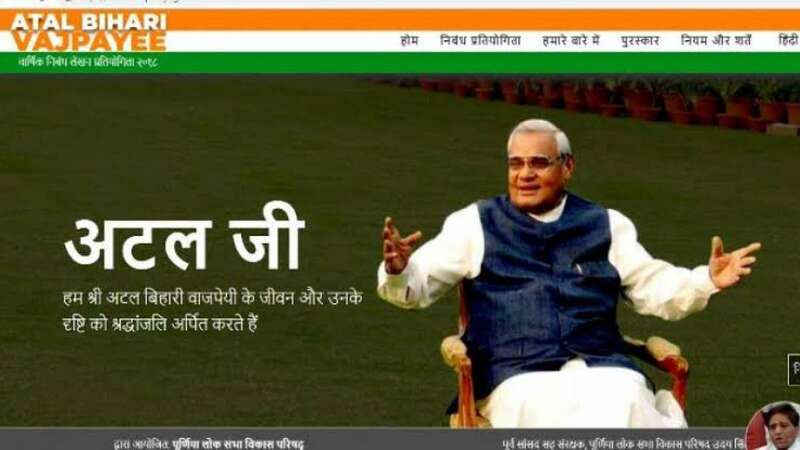 The results will be declared at 12 PM on December 25th, 2018 (Atal ji’s birthday) on www.atalpratiyogita.com. 18 students will be given cash rewards worth Rs 4.50 lakh. The students will also be awarded a certificate of participation. The students are free to write the essays in Hindi, Urdu, and English. Each of the three languages in the essay contest shall have a First, Second and Third prize. Winner of the First prize from the college section will be rewarded Rs 50000, the Second and Third prize winners will receive Rs 25000 and 15000, respectively. Under the school section, the First prize winner will be given Rs 25000 while the Second and Third prize winners will be awarded Rs 15000, Rs 10000, respectively. This competition is open for all the students in Bihar. The students can visit the website and upload their essays. The entries will be judged by independent markers who will (at their sole discretion) apply the marking criteria. Teachers from all over the country have been invited to act as Independent markers. They will receive the entrants' essays anonymously to ensure fairness. The short-listed essays will be reviewed by another marker before reaching the final decision of winners. The word count for school students is a maximum of 1000 words while the college students have a maximum word limit of 1500. This competition will be held every year in the month of October and winners would be announced on December 25.